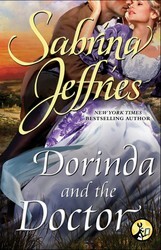 New York Times bestselling author Sabrina Jeffries loves regency romance, just like us! We’re so excited for her latest release of DORINDA AND THE DOCTOR! It just came out today and we can hardly wait for the workday to be over so we can unwind with a dashing Duke, a delightful romance, and of course, sweatpants. Because the day will be over, people. But Sabrina also has a playful side. Check out her creative comic below! For more of Will and Jane’s Excellent Adventure, visit Sabrina’s website or her Pinterest page! When I started Will and Jane’s Excellent Adventure six years ago, I didn’t expect it to provide me a way to indulge my love of miniatures. The comic began when I received a Jane Austen action figure and a Will Shakespeare caricature figure for consecutive Christmases. Will was much shorter than Jane (with a bigger head, naturally), so when I put the two figures next to each other, I flashed on how they would interact as characters. And Will and Jane were born! At first, I was satisfied with just them and whatever items were on my desk. Then I added a few props—a monkey that reader Elsie Hogarth gave me, a miniature bottle of beer my former assistant, Suse, brought over, a tiny book I found in a craft fair. Soon it blossomed into twenty-plus characters and fifty or so props, including a library backdrop given to me by friend and reader Lynn Eyermann. Recently my husband and I took a short vacation to Colorado, where we shopped in Rocky Mountain Miniatures in Georgetown as well as in the gift store for the Denver Museum of Miniatures, Dolls, and Toys. I was looking for a mini skeleton when it dawned on me that although I’d always refused to make collecting miniatures a formal hobby, knowing that it could get obsessive very fast, I’d still fallen into it through the back door with Will and Jane. Faced with that revelation, I decided not to fight it anymore. So now Will and Jane have a new closet (complete with skeleton), a bedroom set, and other little goodies that will appear in subsequent comics. Hubby got in the act by mentioning that we should build a doll house for them! Uh oh. I can see us headed down the road to collecting hell right now. Oh, and I have pics of the miniatures we saw up on my page today!